So, ‘X’ hour has come, but the ‘sensational’ denunciation that OCCRP and ISIJ made against the Russian President was so weak, and the conclusions are so far-fetched that under other circumstances they would not have been published even in some student newspaper. However, despite the fact that 112 persons were mentioned (from the late father of David Cameron to Petro Poroshenko, from Ilham Aliyev to the King of Saudi Arabia) both the Western ‘free press’ and the media like ‘Novaya Gazeta’, collaborating with OCCRP, pretended they found something really worthwhile, giving the first columns for the strange stories about offshore accounts of Russian businessmen allegedly in friendly relations with Putin. Obviously, this is not a mere coincidence, and yet another confirmation of a planned attack on the head of our state [the Russian Federation –trans.]. Let’s talk now about who exactly is behind those ordered materials and who does the dirty work in Russia? 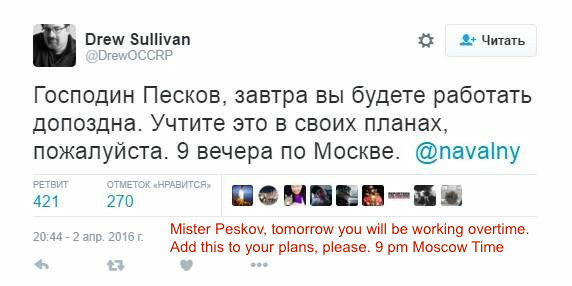 Meet Drew Sullivan – journalist, co-founder of The Organized Crime and Corruption Reporting Project (OCCRP). At the time he worked for for the Tennessean newspaper in Nashville, as well as for Associated Press. He was a structural dynamicist on the Space Shuttle project and even a stand-up comedian [see his biography in his own words]. In 2004 he founded Centre for Investigative Reporting in Bosnia-Herzegovina. Among the partners and sponsors of the project are USAID ([United States Agency for International Development –trans.] government agency), NED [The National Endowment for Democracy –trans. ], Transparency International and the European Union. The Organized Crime and Corruption Reporting Project (OCCRP) started in 2006 by Drew Sullivan and Paul Radu. In 2013, Sullivan produced a report to NED [to its project called The Centre for International Media Assistance (CIMA) –trans. ], in which he described in details the mechanism of interaction of donors with investigative organizations in order to prevent any queries of the audience about for whose benefit the report was done and who its sponsor was. What exactly this structure is doing is not clear as its official website does not exist. However, it is known that this organization does not only regulate the activity of OCCRP, but also acts as the financial middleman between the latter and the government of the United States. Overall organization of the Journalism Development Network, Inc. receives huge amounts of funds from USAID and the State Department. As we can see in front of us is a typical example of an grant-eater organization and its founder, tightly sitting on a financial needle of the State Department and USAID. Because of it, they are a tool of American foreign policy. It is noteworthy that the Sullivan’s organizations not only spend money of American taxpayers but also direct financial flows to Russia. According to tax returns, only in 2012-2013 years, not less than $326,000 were sent by OCCRP to support investigative journalism in Russia and the CIS countries. American laws allow NGOs not to specify the final recipient of the grant for the benefit of its activities. However, on the OCCRP website there is the only media of Russian origin – ‘Novaya Gazeta’, which is stated as a partner of the Centre. Active cooperation OCCRP with ‘Novaya Gazeta’ is visible to the naked eye. So, in 2015, officials of OCCRP initiated in ‘Novaya Gazeta’ large number of publications highlighting the Magnitsky case, the corruption in the RF, the transfers $20 bn from Russia. So there is nothing surprising in the fact that particularly ‘Novaya Gazeta’ became a partner of OCCRP and ISIJ in the publication materials of the “investigation” on the territory of Russia; in fact, acting as one of the “flushing cisterns” of another poor quality order on Putin. 1. The widely publicized investigation about Putin turned to be nothing – nothing new and nothing to prove the charges that were made. In fact, they created out of the thin air something newsworthy and promote it through media that are ‘tamed’ or simply unfriendly to Russia. 2. What we face is not journalism but the information attack. 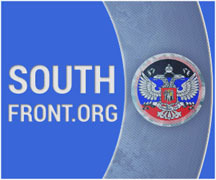 It is proved by the fact that the key publications on the primary source website (ISIJ) and in the international media (The Guardian, USA Today) exploit not withstanding any criticism stories around the Russian President (even though he, himself, would not appear in them), while much more substantiated allegations against Poroshenko, family members of the Chairman XI Jinping, the late father of Cameron and other people are interested nobody. It is laughable, isn’t it? 3. Why information blow struck just now is understandable – there are large Federal elections forthcoming and we see the attempts of brainwashing via discrediting respected people. 4. You should already have drawn your attention to the fact that there are no Americans in the investigation? Is not it because sponsors of “investigative organizations” are located in Washington? The story as old as time: governs the one who pays. And finally: I would advise our the Federal Tax Police [of Russian Federation –trans.] take a closer look at ‘Novaya Gazeta’. There is, of course, no direct evidence of its financing by OCCRP but the money was sent to someone. Also the cooperation of the media with the Centre is so obvious that it requires no further confirmation.